Update: There is currently a 50% discount promotion of annual fee for KTM iCard Student application submitted by 4th February 2016. School (Form 6), College/University student in Malaysia. Annual fee RM31.80 (GST inclusive). Supporting letter from school (form 6), college/university must be attached. Valid for one year from date of issue or after the end of studies, whichever is earlier. Card holder eligibility for concession ticket subject to item 2.3. Purchase of concession ticket at KTMB counter only. Date of travel does not exceed 30 days from date of purchase. Concession rate is 40% from adult traveling fare. Eligible for all type of coach. Cancellation of ticket and amendment of date and/or coach type and/or train is allowed subject to term and condition and item 2.3(1). KTMB i-Card must be produced at ticket counter to get concession rate. Concession rate eligible for KTM Intercity and ETS services only. Eligible from and to any station subject to terms and conditions of Short Distance Tickets. NOT eligible for purchasing via e-ticket or kiosk ticket. NOT eligible for purchasing via ticket agent. Refund of ticket subject to cancellation terms and conditions. NO special quota for concession ticket (subject to ticket availability). Passengers must produce KTMB i-Card and passport or identity card during inspection of ticket by KTMB staff in KTMB premises and/or on board the train. Refer item 3.1, should passenger fail to produce KTMB i-Card and passport or identity card for whatsoever reason, adult fare without concession and surcharge will be imposed to passenger. Refer item 3.2, NO refund for any ticket if KTMB i-Card and passport or identity card were produced after adult fare without concession and surcharge were imposed. Refer item 3.1, if name and/or passport number of identity card number is different against printed on ticket, adult fare without concession and surcharge will be imposed to passenger. Refer item 3.2, NO refund for unused ticket. KTMB i-Card holder whose boarding the train without valid ticket, for whatsoever reason, adult fare without concession and surcharge will be imposed to passenger. Original receipt is valid to be used within 30 days for purchase of ticket subject t o item 2.3. Original receipt is valid to be used within 30 days for inspection purpose by KTMB staff. Self collect card at selection station counter once receive notification via email or phone call from KTMB. Refer item 1(3), KTMB have the right to enforce new annual fee without prior notice. Date of travel cannot exceed the expired date of KTMB i-Card. If lost even with whatsoever reason KTMB will not replace for the new card and the customer must make a new application in accordance with article 1 with charge RM10.00. 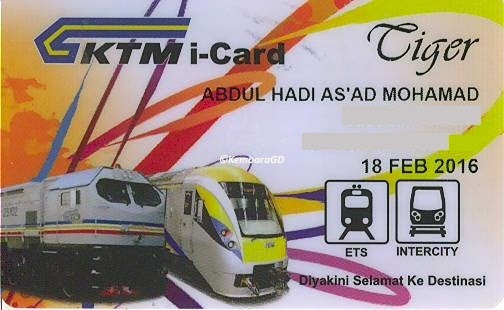 KTMB shall NOT refund the annual fee of KTMB i-Card for whatsoever reasons. These terms and conditions effective 1 December 2014. KTMB have the right to amend terms and conditions without prior notice. For enquiry: email to [email protected] or call 603-22631111 ext 8000 or call KTMB callcenter.